The walls, ceiling, woodwork, floors and carpets Salon are similar to the Senate President's Office. Decoration is in classic style, with stylized decorative elements, which are found both in the finish wall, where he used cherry wood and the ceiling elements. Room area is 360 square meters and a height of 11 meters. Fair was officially inaugurated in 1995, was originally included Parliamentarians Club premises, intended as concert hall. Here was located a piano manufacturing valuable Austrian Bösendorfer. 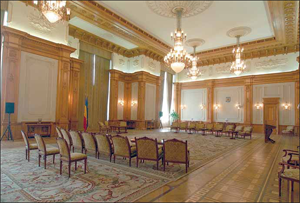 When moving the Senate in the Parliament House, the room became the official Salon, taking place here with delegations making official visits to the President of the Senate. The official Show takes place annually, the official receipt of about 15-20 heads of state, presidents, parliaments or parliamentary chambers, the prime ministers. From the long list of state figures who have been guests in this room, we will mention the homage, only the name of former President of the Republic of Poland, lost in the tragic air crash of Smolensk on 10 April 2010. Mr. Lech Kaczynski was in this hall in 2007 and 2009.